This book takes a close look at the ways that five sign languages borrow elements from the surrounding, dominant spoken language community where each is situated. It offers careful analyses of semantic, morphosyntactic, and phonological adaption of forms taken from a source language (in this case a spoken language) to a recipient signed language. In addition, the contributions contained in the volume examine the social attitudes and cultural values that play a role in this linguistic process. 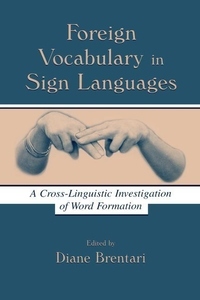 Since the cultural identity of Deaf communities is manifested most strongly in their sign languages, this topic is of interest for cultural and linguistic reasons. Linguists interested in phonology, morphology, word formation, bilingualism, and linguistic anthropology will find this an interesting set of cases of language contact. Interpreters and sign language teachers will also find a wealth of interesting facts about the sign languages of these diverse Deaf communities.